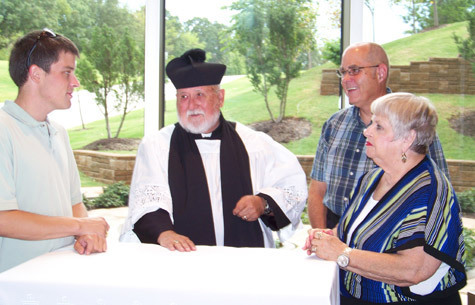 Father Bob Hall, pastor of St. George Anglican Church, speaks with parishioners Jason Maloy, his wife Patricia Hall and Cal Smith at the close of Wednesday evening prayer at Mercy Medical Center in Rogers Aug. 10. ROGERS -- St. George Anglican Church in Rogers is one of 100 traditionalist Anglican parishes in the United States seeking to join the Catholic Church as a group. According to Father Bob Hall, pastor of St. George Anglican Church, the small parish of 17 members was established in 2004 when the ordination of women and the ordination of an openly gay bishop in the Episcopal Church came into the public spotlight. The Traditional Anglican Communion, which St. George Church belongs, is a group of churches that separated from the worldwide Anglican Communion in 1991. It claims 400,000 members worldwide, including Australia, Canada, Puerto Rico and England. In October 2007, bishops of the Traditional Anglican Communion in Portsmouth, England, petitioned the Holy See to come into full communion with the Catholic Church, while retaining Anglican traditions and liturgy. Pope Benedict XVI responded on Nov. 4, 2009, with the apostolic constitution Anglicanorum coetibus ("Groups of Anglicans"), which provides for a personal ordinariate -- a geographic region similar to a diocese -- that would allow former Anglican parishes or groups to come into the Catholic Church while preserving their Anglican liturgical practices and heritage. An ordinariate is already approved in England and are in the works in Australia, the United States and Canada. Father Hall said, "When the Holy Father issued his Anglicanorum coetibus, what it said in essence is, 'Come home. You can maintain your traditions and your liturgy within the confines of the Church. Come just as you are.' We will not be a separate rite, but rather a separate use. Much like the traditional Latin Mass, we will then have the Anglican Mass." Addressing the new change, Msgr. Scott Marczuk, pastor at St. Stephen Church in Bentonville, said, "The Holy Father wants this Christian unity that has been separate for so long to now be a legitimate part of our heritage. In its communion with Rome, it will find its fulfillment." "In this document, by having the personal ordinariate, it brings about union with Rome and defines its Christian origin. This enriches all of us. To be one in the Catholic faith doesn't mean 'uniform' but rather the Church has unity with diversity such as those in the Eastern Rite. They are Catholic but not an expression of the Roman Catholic Church." The Catholic Church has long been working with Anglican and Episcopal priests and laity to welcome them into the Church. In June 1980 the Vatican granted a special provision known as the "pastoral provision" that allowed the ordination of individual Anglican and Episcopal priests as Catholic priests. It was followed in 1983 when a special commission convened in Rome to establish the Anglican Use liturgy for former Anglicans who are in full communion with Rome. Msgr. Marczuk said these recent events are an opportunity for Catholics to learn more about Church history. "This is enriching both Catholics and fellow Anglicans. We should do the best that we can to accommodate them," he said. The personal ordinariate for the United States is expected to be approved by the Vatican this year. Cardinal Donald Wuerl, archbishop of Washington, has been named the delegate to assist these Anglican groups. The entry of the Traditional Anglican Communion into the Catholic Church requires each Anglican Use parish to prepare and submit a request through the proper channels to enter the personal ordinariate. As pastor of St. George Parish, Father Hall has completed the necessary dossier for the transition. Father Mike Sinkler, former pastor at St. Stephen Church, and Msgr. Marczuk have assisted with the preparation of the request. In preparing the dossier, Father Hall said, "I had to write a letter to the Congregation for the Doctrine of the Faith, asking to be considered for ordination as a priest. My wife, Patricia, had to write a letter, saying that she approved of my becoming a Catholic priest. Then two letters of references. Father Mike provided a letter of character reference for me as well. Msgr. Scott provided a great deal of the legwork to be sure we had it all." Because the Anglican priests must be ordained Catholic priests during the formation period, there will be a period of study and conferences for those coming into the Church. In addition, the laity coming into the ordinariate will make a profession of faith as Catholics, using the United States Catholic Catechism for Adults for their faith formation. Once the process is complete, St. George Church will be welcomed in the Diocese of Little Rock. In July, Father Hall and his wife attended the National Anglican Use Conference of the Catholic Church in Arlington, Texas, with 225 people. It included Anglican priests and laity who will be received into the Church once the new ordinariate in the United States is established. Until the personal ordinariate is approved, St. George Parish uses the chapel at Mercy Medical Center in Rogers for their Sunday services and Wednesday evening prayer. Sister Anita DeSalvo, RSM, has acted as liaison for the past year at Bishop Anthony B. Taylor's request. "The bishop said he wanted to support them any way he could through this process," Sister Anita said. "The congregation has been faithful during this time, usually an average of 15 people on Sundays. I think they have had a few more people join their church while they have been meeting here. When this process is over, I would think they would want to be out and away from the hospital. Then they would have a much more significant kind of presence in the community here in northwest Arkansas." After attending a recent prayer service, Cal Smith, a Catholic from Neosho, Mo., said he is interested in the "old liturgy." Moving from Omaha, Neb., upon retirement, he said he missed the Latin Mass he often attended there. A convert to Catholicism in 2005, Smith said, "I love the reverence instilled in the traditions of the Anglican liturgy. That is why I make the trip to Rogers for the services." Father Hall's wife Patricia said, "Some of the churches have gotten so large. Because of this, some people find they would prefer a smaller church. That is why they come to us in the first place. Some of them have young children." Father Hall added, "We need families with young children. That is the lifeblood of the parish." A lay reader at St. George, Jason Maloy is one of the young people involved in the parish. Baptized in the Episcopal Church at 18, he moved to northwest Arkansas to attend the University of Arkansas. "When I discovered there was an Anglican church up here, I decided to call about it," he said. "I drove up to meet Father Bob and Patty to have coffee with them. I just adopted them."